Lulled for a year by the mellow pace of Thorne Bay and Wrangell we drove our country-mouse selves off of the Alaska Marine Highway ferry "Malaspina" and into the frenzy of Juneau in mid-December. We had the 'Master List' tucked into a jacket pocket; marching orders for items to shop for, appointments, and errands. The main draws for the trip, though, were visiting family and friends and continuing education classes. Our plate was full even before we arrived in town. The "Malaspina" was built in 1963, and still provides a great ride in a casual and friendly atmosphere. I love these ferries! It took a bit to acclimate to the busy buying season in Juneau. The city was in motion as people worked through their own lists. The details that each shopper must see to for the holidays are spread throughout this city, in stores strewn about downtown Juneau, through the Lemon Creek area, in the valley, near the airport, and out to Auke Bay. Between those regions traffic flows fast with cars and drivers fueled by gasoline and caffeine. Just days away from the darkest day of the year and a week away from one of the warmest and brightest family times, a whiff of desperation mixes with exhaust fumes and road spray, and the four lanes of Egan Drive require extra Spidey-sense to stay safe. I used to live in Juneau, and my right foot came out of it's village-induced torpor and remembered the drill: it flexed, cracked it's knuckles, and applied itself to the accelerator and brake with vigor in automatic tasks of self-preservation. I found it difficult to break the small town habit of saying "hi" to everyone we saw on sidewalks and in stores. At a population of 32,000, Juneau has taken on the anonymity-in-a-crowd feel of a larger city. A few people had obviously clicked "minimize" on their sense of humor page. Most Juneauites, though, have but a delicate veneer over their innate Alaskan friendliness, and that thin layer melts away when faced with a smile and a happy comment. After several days of errands, obligations, and city bustle it was time for a reset, so my sweetie and I drove out to the Mendenhall Glacier to take in some Alaskan scenery. It's a thang. 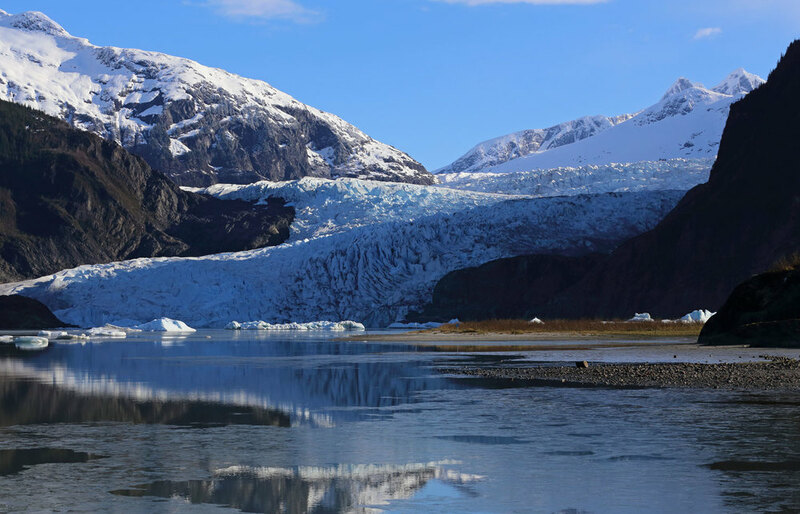 We joke about going out to make sure that the glacier is still there, still spilling down from the 1500 square mile Juneau Ice Field and terminating at Mendenhall Lake. This slow river of ice wrinkles and cracks as it flows, and then calves at the face revealing a turquoise so deep and so rich that it will slake a mid-winter thirst for color. The sun managed to heft itself up clear of the mountains and break through the clouds and fog for a few minutes. It lit up the glacier and lifted our day. Color, light, and rugged Alaskan beauty....does it for me every time. The clouds closed back in, the sun went to bed at 3 in the afternoon, and we returned to the tasks of the now-dark day: people, paperwork, and product procurement. The push and pull started to take it's toll. My boundary walls slammed into place at a simple doctor's check-up visit when the paperwork asked what religion I practiced and what line of work my spouse was in. After being in a town without one single stoplight the myriad of flashing school zones, stop lights, and blinking yellow arrows in Juneau were getting to me. This was awfully far away from walking a deer trail in the woods. Loop Road in the Mendenhall Valley runs through residential areas. Mount Bullard in the background juts up to 4225 feet above sea level. I was driving down Commercial Boulevard past angular construction equipment, chain link fences, the giant vats and hoppers of the Alaskan Brewing Company, and toward two huge box stores with their lit signs and vast parking lots when I saw the peace sign. Most of the snow melted a few days later and the peace sign was more subtle. It is a state of mind and a choice of expression. I'll try to remember this and be peaceful every day in every place. Even when my surroundings are feeling stressful. To those who took the time and energy to cut through the alder scrub next to a commercial zone, giving an entire city a beautiful reminder to practice peace and mindfulness, Thank You. And to each of you reading this, my friends, I send my love out to you, and a wish for you to enjoy a peaceful Christmas and New Year. Fresh skim ice near the edges of Mendenhall Lake spoke of the temperature as I walked along the shore toward an area of activity. The sun was just starting to peek around Mount Bullard, highlighting the ridges of the Mendenhall Glacier, and the icebergs in the lake. A rising and falling k-k-krr, k-k-krr sound, punctuated by quick, sharp cries came from the brownish, brushy area that you can see on the right of the photo above. White wings flashed in the light of the rising sun. I picked up the trail to the photo point on a rock outcrop. An Arctic tern flew by, all business, but so graceful as to remind me of a porcelain sculpture. A few minutes later I saw a tern flying with a small fish in its beak, swooping and turning to avoid other terns. The sand spit is cordoned off with a sign that says the terns are nesting, and from the viewing area I can just make out a nesting site. It is just a small dip in the sand occupied by a grey and white bird with a black head. To brighten up the outfit the bird accessorized with brilliant red beak, legs, and feet. It's mate landed and settled next to the nest. Arctic terns at their nest. Nearby a tern brakes in the air, working its wings to hover a few moments while looking down into the water. It flies another fifty feet, hovers again, then dives for a fish. It misses and moves along, stopping in midair, hunting. It is a pleasure to watch such graceful and athletic birds. These guys aren't just aerobatic, they are also distance fliers. The Arctic tern migrates between the Arctic and Antarctica, flying over forty thousand miles a year, and catching the longest hours of daylight in each region. So after flying twenty thousand miles in about forty days they show up with every feather perfect. Yep, I'd show up with bad hair and then sleep for a week. If you want to see Arctic terns then this is a very easy location to view them from. In late May drive to the Mendenhall Glacier parking lot, walk on a paved path for ten minutes, and you are there. To see them in motion is worth it. Their flight is reminiscent of butterflies and swallows, of a kite on the wind, of dancers. Diving in for a morning dip. A morning bath in glacial water. ... and getting prettied up for the day. Arctic tern preening after a bath. This early on a cold morning there are only a few other people at the glacier. Another photographer found a tern perched on an iceberg. Who do you think has the coldest tush, the kayaker or the tern? Getting close to the subject. ...even though I wanted to pick it up and build it into an art project. Even a single feather is graceful and elegant. What a delight it was to see the beautiful Arctic tern. I hope that you enjoyed this glimpse of them.